Rigid foam insulation offers high R-value, effective draft stopping, and excellent resistance to mold and moisture damage. Crawl space insulation has a much bigger impact on a home's energy efficiency than most people realize. However, due to the difficulty of accessing the crawl space, insulation is often overlooked when people are aiming to improve energy efficiency and reduce heating and cooling problems. Dr. Energy Saver offers proven solutions for crawl space insulation that are sure to make a difference in your home. Contact us today to discover how these products will work in your home! If your house has a crawl space foundation, there are some very basic symptoms of poor crawl space insulation. During chilly winter months, floor areas above the crawl space will be cold and uncomfortable to walk on barefoot or in just socks. Another sign of improper crawl space insulation is musty odors coming up from below. Using the wrong kind of crawl space insulation can actually increase the likelihood that mold and mildew will grow in the dark, damp crawl space. The old-fashioned way of insulating a crawl space was to install fiberglass batt insulation between the exposed joists in the crawl space. Fiberglass is cheaper than other types of insulation and also widely available. However, its tendency to absorb moisture, support mold, harbor mice, and sag or fall out of place are all negative qualities that argue against its use in crawl spaces. The best insulation material for crawl spaces is rigid foam insulation board. Instead of installing the foam insulation between floor joists in the crawl space, the foam board is installed against the crawl space foundation walls. Unlike fiberglass, rigid foam insulation does not absorb water, support mold or allow air to pass through (providing that joints between boards are sealed with tape). If you have cold floors above your crawl space or a damp, moldy crawl space, Dr. Energy Saver is here to help. We provide quality crawl space insulation solutions that will improve your home's comfort and energy efficiency. 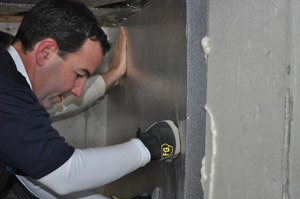 Contact your local dealer today to have a certified inspector determine the best course of action for your crawl space.